Wow, he's not a happy camper. But at least he didn't kill his boss like the dude in Spain (Madrid) who hired a contract killer to murder his boss in a desperate bid to avoid being laid off. There a cool blog about passive aggressive notes, that would be perfect. I forgot that I would lose my blogroll too so I have to hunt all my favorites down. You need one for what a lottery winner really wants to say to the cameras. lol this is so funny! XD i had a good laugh! Hilarious! Is this for real, would be sweet if it was. Just what I need to cheer me up. 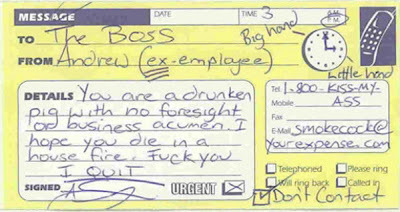 I can understand how the boss must have mistreated this guy who resigned.